Yes, you can wear leggings on United (but airline can police your clothing). 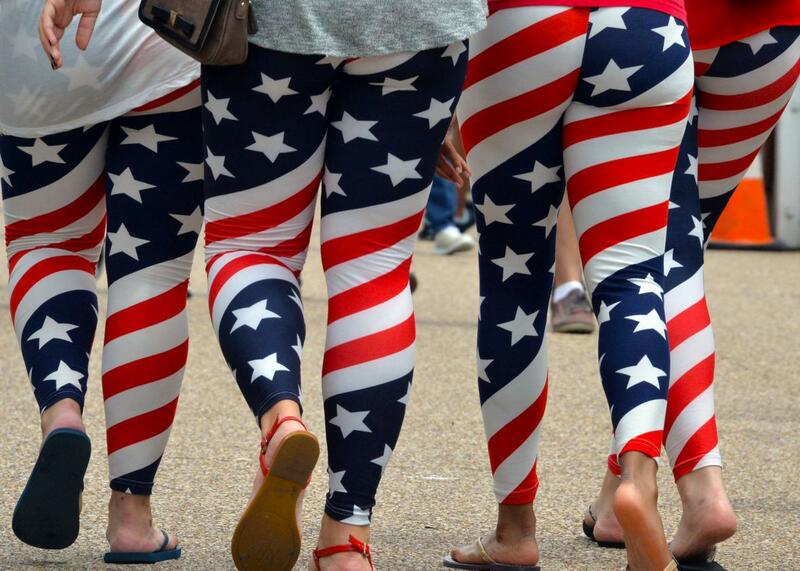 Four young women wear U.S.–flag leggings as they walk on Pennsylvania Avenue in Washington, D.C. on July 4, 2015. United Airlines suddenly found itself on the receiving end of mass social media outrage on Sunday morning when a Twitter user sounded the alarm that young girls wearing leggings were not allowed to board a domestic United flight. United Airlines took to Twitter to repeatedly defend the right of the gate agent to refuse boarding to anyone deemed no to be dressed appropriately. But then the company came out to clarify that the girls prevented from boarding were what are known as “pass riders,” or those who fly for free or sharply reduced rates because they’re employees or their relatives. The company insisted regular paying customers are more than welcome to wear leggings on United flights, but there are special rules for pass riders. “Our regular passengers are not going to be denied boarding because they are wearing leggings or yoga pants,” a spokesman said. “But when flying as a pass traveler, we require this pass travelers to follow rules, and that is one of those rules. Seemingly realizing it had a PR disaster of its own making in its hands, the company quickly changed tack and started to clarify that the passengers in question were pass riders who had to adhere to stricter rules. Flip flops, for example, aren’t allowed for pass riders either, a company spokesman said. Many of those who raised their initial concerns insisted the company was applying a sexist rule. Watts, for example, quickly pointed out that the man flying with the two girls was wearing shorts.